I've already written about Part 1 which covers the Bomber & Photo-Reconnaissance versions of the Mosquito. Valiant Wings continues their excellent coverage of the type by releasing Part 2, this time covering Fighter, Fighter-Bomber, Night-Fighter and the Sea Mosquito. Like all Valiant Wings books this is the be-all/end-all title on the subject matter, especially for modelers. 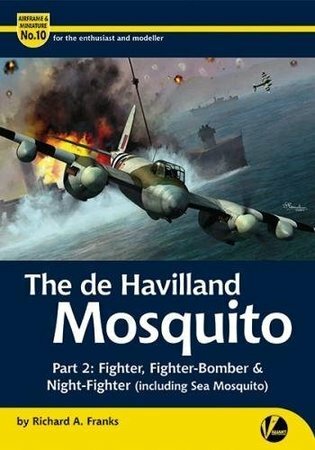 It will also interest historians interested in the aircraft-type, but since the Airframe & Miniature titles are aimed more towards the modeler, if you want to build any of the Mosquitos outlined in this book then you must pick this one up. I always enjoy the 1/72 modeling section by master-modeler Libor Jekl and seeing how he created the models he did. While the rest of the book is top-notch and first-rate, its seeing Libor's builds that make these titles truly outstanding for me. My favorite would have to be his FB Mk.VI converted into a Czechoslovakian B-36. Stunning! This book is very highly recommended. My thanks to Valiant Wings Publishing for the review title.